So, I discovered something interesting about myself this weekend. When I meet famous people, I start shaking. 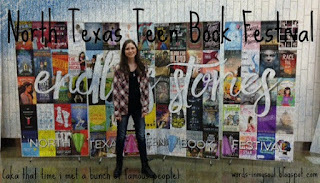 On Saturday, I was lucky enough to be able to attend the North Texas Teen Book Festival (NTTBF for short). There were so many well-known authors there. So many. 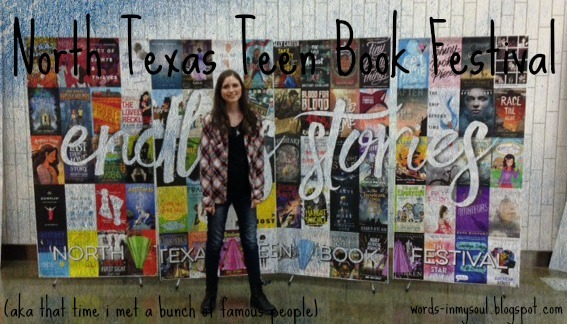 Authors like Veronica Roth, Maggie Stievater, Victoria Aveyard, Marie Lu, Stephanie Perkins, and many, many, many others. The ones I was really excited about are all relatively lesser-known: Shannon Hale, Ally Carter, Ally Condie, Lisa McMann, Claire Legrand, and Matthew J. Kirby. And I got to meet all of them. The day started off with panels, where I got to see and hear the authors talk about everything from mental health in books to their favorite ships in Buffy The Vampire Slayer to writing fantasy. mental health panel featuring Jeff Zentner, Jennifer Niven, Adam Silvera, John Corey Whaley, Justine Larbalestier, and Sonya Sones. I also spoiled myself and bought four books(technically five, because The Scorpio Races is for a friend who lives several states away). They didn't have all the books I wanted(more on that later), and I made a few surprise perchases, but I'm happy with what I got. I also brought alllllll these books from home to get signed. My arms and shoulders were killing me by the end of the day. Books are heavy, kids. I really enjoyed the panels, but the highlight of the day was by far the signings. Ah, the signings. I brought his book Icefall to be signed. It's a lovely book about Norse people/Vikings, survival, loyalty, family, and the power of storytelling. I'm in desperate need of a reread. He was super nice and thought it was cool that I'd brought my own copy of the book from home instead of buying it at the conference. Boy oh boy was I nervous about meeting Mrs. Hale. I've loved her books for so long and I really admire her writing ability. I probably sounded like an idiot while we talked, but it was worth it. I brought my copy of Goose Girl and my sister's copy of Princess Academy to be signed, because that girl has read it so many times she has the first page memorized. Mrs. Hale was very impressed. She's going to MYWW as well, and I hope I'll be a little a lot less awkward next time we talk. So, I haven't read any of his books, but he said some wonderful things in the mental illness panel and just seems like the friendliest dude ever, so I had him sign my notebook. And no I'm not short, he's just ridiculously tall. And now for the grand finale. The "more on that later" from earlier. The highlight of the entire day. If you haven't seen my glowing review of her book Some Kind of Happiness on Goodreads, let me take this opportunity to tell you that it is one of the best books I've read in my life. It's so incredibly important to me. So when I found out that Claire would be at the conference, I just about died. I was going to buy the book! And meet the author! And let her know how much it means to me! But by the time I got to the book-selling area, it was sold out. I was absolutely heartbroken. I thought I'd lost my chance to talk to Claire. But then just a minute later, I noticed her nearby talking to her family. I worked up my courage, pulled out my notebook and pen, and approached her hesitantly. She hugged me twice(!!! ), wrote me a short note that I will treasure until the end of my days, told me to email her for a bookplate, and listened to my stammering, help-I-can't-stop-shaking, rambling explaination of how much I appreciate Some Kind of Happiness. Then, after the signing was basically over and everyone was cleaning up and heading home, I went over to her and we talked again about depression and anxiety, writing, and how wonderful the conference was. And she hugged me again. I'm so grateful that Some Kind of Happiness was sold out. If I'd bought the book, we wouldn't have talked so much, and I wouldn't consider her a friend. It was proof that sometimes the things you want the least are the things you need the most. if you hear screaming in the background, that's definitely me. Have you ever met an author you look up to? Have you goten any good books or gone to any bookish events recently? How many signed books do you own? According to Goodreads, I have 11. That number will hopefully increase in the future. THAT IS SO COOL. I've never *met* an author I look up to, but I got a handwritten response letter once- I died, I swear. THIS IS SO AWESOME! SO MANY AUTHORS!! AHHH! I really love Adam Silvera's books and omg MAGGIE STIEFVATER IS THE BEST OF EVER. That's so awesome you got to see her, if not meet her. And I'm so glad you got to meet Claire Legrand after all, even if the books were sold out. 😍🎉🎉 This is amazingness. SO LUCKY! !